HBO Documentary Films presents a weekly series this fall, debuting provocative new specials every Monday from October 7 through December 9. Featuring recently unearthed photographs, rediscovered performance footage and the words of entertainers and historians, Whoopi Goldberg Presents Moms Mabley includes interviews with Eddie Murphy, Joan Rivers, Sidney Poitier, Kathy Griffin, Harry Belafonte, Bill Cosby, Quincy Jones, Arsenio Hall, Jerry Stiller and Anne Meara, who emphasize how Mabley paved the way for female comedians and performers everywhere in provocative stand-up routines that challenged racism, sexism and ageism. 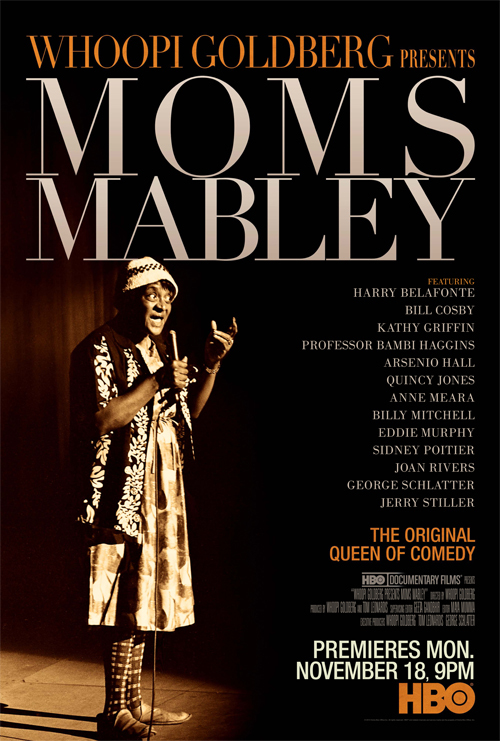 Whoopi Goldberg Presents Moms Mabley debuts as part of the HBO Documentary Films Fall Series on Monday, November 18. Often referred to as "the funniest woman in the world," the iconic African-American standup comedienne Jackie "Moms" Mabley broke racial and sexual boundaries and continues to inspire comedians to this day. In her directorial film debut, a modern-day comedy favorite pays homage to this pioneering talent. Goldberg also executive produces the documentary, along with Tom Leonardis and legendary producer and director George Schlatter, creator of "Rowan & Martin's Laugh-In." Whoopi Goldberg Presents Moms Mabley debuts MONDAY, NOV. 18 (9:00 p.m. ET/PT), exclusively on HBO. HBO Documentary Films presents a weekly series this fall, debuting provocative new specials every Monday through Dec. 9. Other November films include: "Tales From the Organ Trade" (Nov. 4); "Dial One For Vets" (Nov. 11); and "Toxic Hot Seat" (Nov. 25).